William and Kate attended the Queen's Sovereigns' Luncheon at royal residence Windsor Castle today. Aside from weddings and funerals, it is the largest gathering of monarchs for a decade. 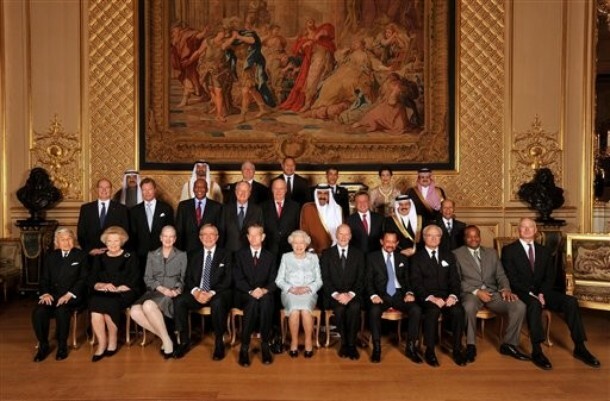 Royals from twenty six countries including Japan, Sweden, Norway, Lesotho, Kuwait, Malaysia, Morocco, Romania, Denmark and Saudi Arabia attended to celebrate Her Majesty's Diamond Jubilee. Notably, Queen Sofia of Spain declined an invitation at the behest of the Spanish government, which has reportedly decided to take issue with an upcoming visit by Prince Edward to the British territory of Gibralter, which Spain has long claimed sovereignty over. You can view the full guest list at this BBC article. Windsor is a mediaeval castle in Berkshire. It has been a Royal home and fortress for over nine hundred years. It is the largest occupied castle in the world. 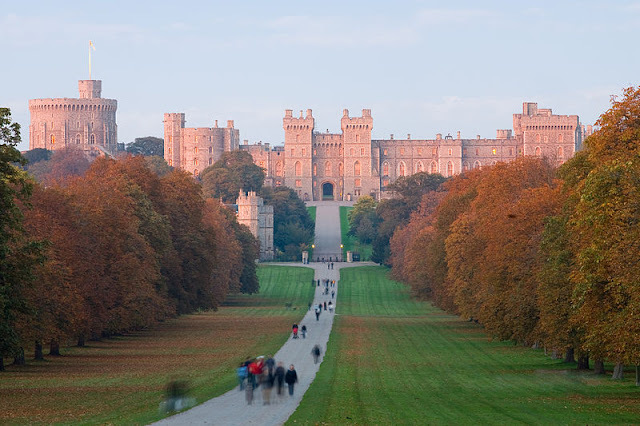 The Queen takes up official residence in Windsor for a month over Easter, a time referred to as Easter Court. It is also often used to host state visits. In November 1992, the castle suffered severe damage in a fire which destroyed many historic parts of the building. You can watch the video here. The castle was gradually repaired at great expense, and questions raised over this expense led to Buckingham Palace being opened to the public for the first time to raise finances for the restoration. Below we see Kate at last years ceremony. The Royals dined at round tables with one member of the British royal family at each table. Interestingly I imagine that means William and Kate were not seated together. Ace photographer @RegalEyes pointed out Kate would have been practicing her curtsies as there was potential for over twenty curtsies for the Duchess, Princess Beatrice, Princess Eugenie and the Countess of Wessex. 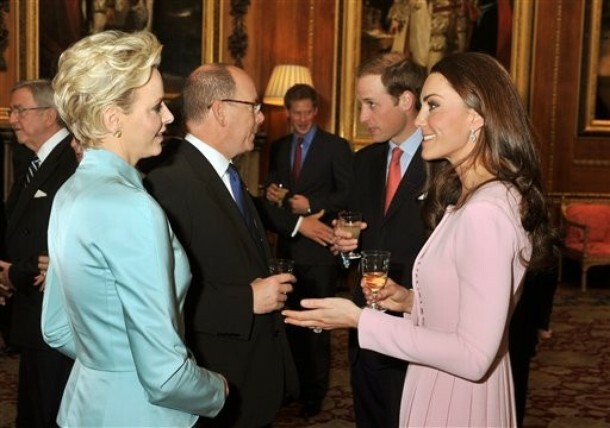 Kate talking to Prince Albert and Princess Charlene of Monaco. A look at the lunch menu. No doubt an important (and daunting) day for the chef. The dress code for the lunch was lounge suit. For women this usually indicates a shorter length dress or suit as opposed to a full length gown. For members of the royal family, protocol has to be taken into account when choosing pieces to wear. 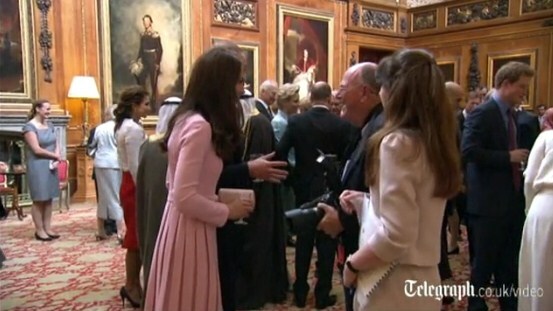 Duchess Kate chose the pink, pleated, double wool crepe, Alice coat dress by Emilia Wickstead. (With many thanks to Kate Spotter) Miss Wickstead said it was made to measure from the current collection and cost £1300. The New Zealand born designer also designed the green coat dress Kate wore on St. Patrick's Day. We haven't seen Kate wear much pink and I thought it a lovely, elegant choice for the occasion. Grazia reported the bespoke piece is based on two dresses from the A/W 2012 collection. 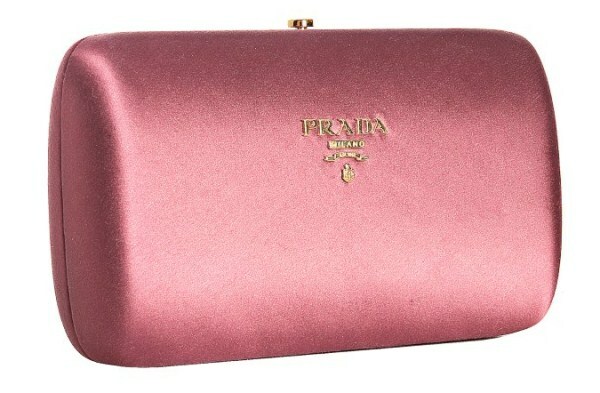 Kate carried her Prada pink satin logo box clutch. Kate previously carried the $556 clutch to the ARK gala last year. Kate completed her look with a brooch, pink Prada satin shoes and drop earrings. You can watch a video from the event at The Telegraph. William and Kate are not expected to attend the dinner at Buckingham Palace later this evening. It is thought to be more intimate affair than the luncheon. I don't know how do you do that, but you are always the first with pictures and news!!! Duchess Kate is very lovely in pink. I was so happy when I saw that you were back. I had just found you when all that mess started and you were going to have to close it down. I am like others, I dont know how you do it but you are the first to get the pictures. You do a amazing job. Love the soft pink, so feminine. I agree with Tanja! Thank you Charlotte! But I didn't receive mail that there is a new post from you? And I follow you by mail? Agree! I always come here first for Kate news - you had it before the Daily Mail today! On another note, is Kate wearing ballet flats? It might be the angle at which the picture was taken, but they look like flats to me! Are Kate's Prada shoes ballet flats?? It might be the angle at which the pictures are taken, but they look like flats to me! Loved the dress and the clutch. It's a pity we can't see the earrings better, and I think the Duchess is wearing a brooch as well, but it is hidden by her hair in most of the pictures. She looked gorgeous and so relaxed... The videos where we can hear the guest talking among themselves are great fun ! All best, Theresa. I love this pink dress. Not sure about the pleats...The very right sleeve dress from the runway looks more classic to me. but overall I like it, particularly with the little jacket on. The silver/blue coat and hat she wore are recylced pieces? They look familiar to me...Have seen them or look-alike somewhere before. I LOVE this dress. I'm not a giant pleats fan, but this is absolutely beautiful. Charlotte!!! I'm sooooo happy you're back!! I can now start my day with your blog again! As always...you have the quickest and best info...I don't know how you do it, but great job!! Love the Duchess' dress! Although I'm not a huge fan of pink, I think she looks beautiful as usual. I love the simple lines of her clothes...so classic and refined. And I'm really loving her A-line skirts. I have a Christening this weekend and the dress I purchased is similar to Kate's "bird print" dress, but with a full, A-line skirt. I also got a white crochet cardigan to go with it. Can't wait to go out with my husband in my Kate-inspired look!! So glad your blog is up and running again. Just wondering, you know you have posted all Kates upcoming events on the right hand bar - is it confirmed that she is attending all of them e.g. Epsom derby etc? If so, so excited for pics! Go on your blog daily! She looks awesome as usual! The color is fab, loved it! Something keeps bogging me... Why only her toes have crimson nails? I'd love to see some nail polish in those hands! As usual, you report better and faster. Thank you so much. The Duchess looks very graceful and feminine. Once again, great choice of clothing. She knows what suits her. Anonymous - Loved the bird dress, Kate wore it three times in casual and formal settings and it always looked stunning, I'm sure your outfit is absolutely lovely. Anonymous - The Palace has not commented on the Epsom Derby but it is 100% expected William and Kate shall attend. Her Majesty has reportedly said she wants a full house! Thank you for your comments, nail polish would be lovely, I think royal protocol often comes into play as much as fashion. I could not see the earrings clearly,,at all! Again the beautiful Duchess hit it out of the ball park. 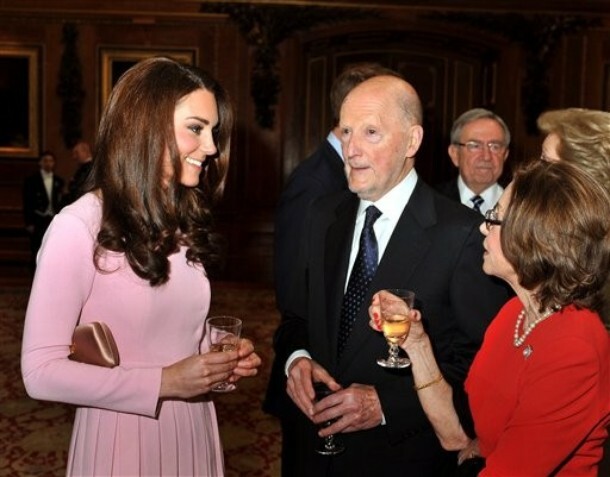 Catherine looked stunning in Pink. I liked the color on her. William & Catherine make scuh a beautiufl couple. I love the way William look's at her. You can tell in his eyes how much he loves her and how proud he is of her. She is scuh a natural at this sutff. YOU would think she was born into the family. Hopefully the Queen was thinking what a blessing the Duchess is to this family. Now we need her to change the Duchess' title to Princess Catherine. I understand that the Queen can do that but you Charlotte would know more then me. I do have to say I was a little disappointed that there was no wearing of tirars today. But I guess since it was a lunch tirars were not needed. Are you going to post something on the dinner tonight or not since the Duchess did not attend. It was a nice dress, very Kate like I would say, but I have to admit that from all the outfits from this event I most liked what Queen Rania of Jordan wore, the red skirt and white blouse, it was different and she really stood out, having this wow effect. A lovely outfit, elegant and appropriate for the occasion. 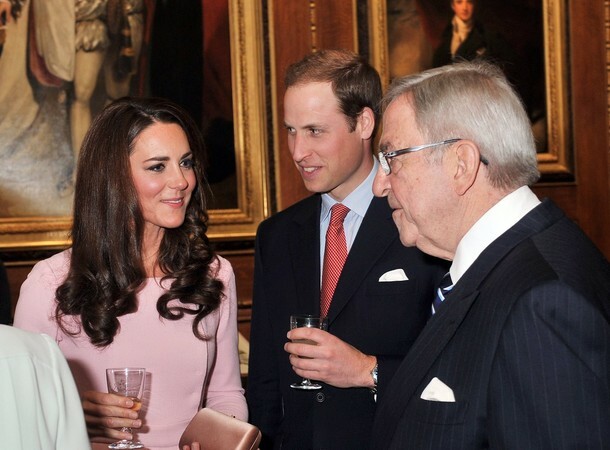 The blush pink is a nice colour on Kate. She really seems at ease in her role, I'm glad about that. Hmm... not a huge fan of this dress. I think it looks much better in the pictures above, either without the pleats or the pleated version with the black sweater. Kate's version feels more like a little girl's dress - sorry, but for $1,300 I think it's a rip off!